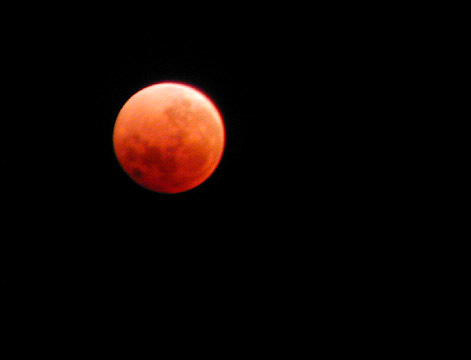 After a less than favorable start to this event, with snow and clouds prevalent in the Rochester area, this photograph was made at 5 minutes after midnight, local time in Rochester, NY, USA on January 21, 2000 during the total lunar eclipse that started on the evening of the 20th. I believe this was during the total eclipse or maybe just as the moon was emering into the penumbra. and exhibited a characteristic reddish color as a result. There is a larger image file of this same photograph 40 Kb image of eclipse here. The photograph was made with a Nikon 950 digital camera held close to the eyepiece of a Meyer-Optik Telemegor 400mm f/5.5 lens (and used wide open) to which a 50mm focal length eyepiece had been attached. This lens was originally made to fit an Exacta camera. The Nikon was set to maximum wide angle setting and the shutter, set to automatic but at +2 exposure value, seemed to operate for an exposure time of about two seconds. This was determined by listening to the noises the camera operate after pressing the shutter button. It sounded like this: ... whirrr ... click ... one missisippi ... two missisippi .. click - picture on LCD! The outside temperature was about 3 degrees F at the time. It was _cold_! As stated above there was no coupling from camera to eyepiece ... just holding it by hand. Both of these photographs were made through the "telescope" and so are upside down and reversed in relation to unaided view of the event. They are presented here as seen through the telescope (although I could have easily flipped them while preparing them. In fact, I forgot about this "quirk" associated with images made through telescopes! 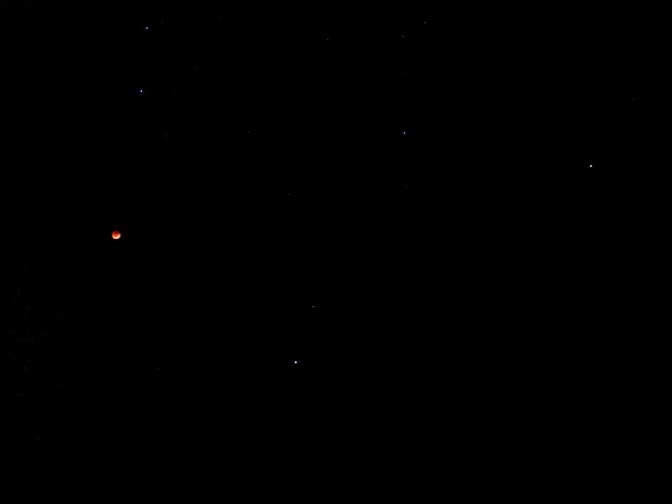 I have one photograph made without the aid of a scope and it shows the position of the Moon in relation to the stars. It is included below. Of course this is an "unreversed" view but to tell the truth I forget the orientation. It was made at the widest angle setting on the camera and includes some stars (planets?) that may provide guidance as to the actual orientation of the photograph. Finally, I also made some photographs on T-Max 400 with a Canon A1 attached to the 400mm lens but these will be processed later. The battery driving the A1 failed due to cold and I had to warm it up twice above a stove to "save the day" but it was a pain anyway. Should have used a mechanical camera or an external source of power kept in a pocked. On the other hand, the digital versions above, for me, are already good enough and the color is nice to have. If I had been truly prepared I would have 1. prepared for the cold, 2. used color film, 3. used tracking and 4. would have gotten some sleep beforehand! My name's Dahl Clark, a friend of Dr. Loren Winters (you might know him) andstationed at Duke University, NC. I happened to be out in the *cold* (boy,it was cold!) during the entire first half of the total eclipse with myAstronomy class, and I know the stages of the eclipse during which your twophotos were taken at eclipse-01-20-00.html. Photo 1: Taken at "five minutes after midnight," the moon is now completelyin the umbra, which is where all traces of direct sunlight has vanished fromthe moon's surface due to the Earth's shadow. 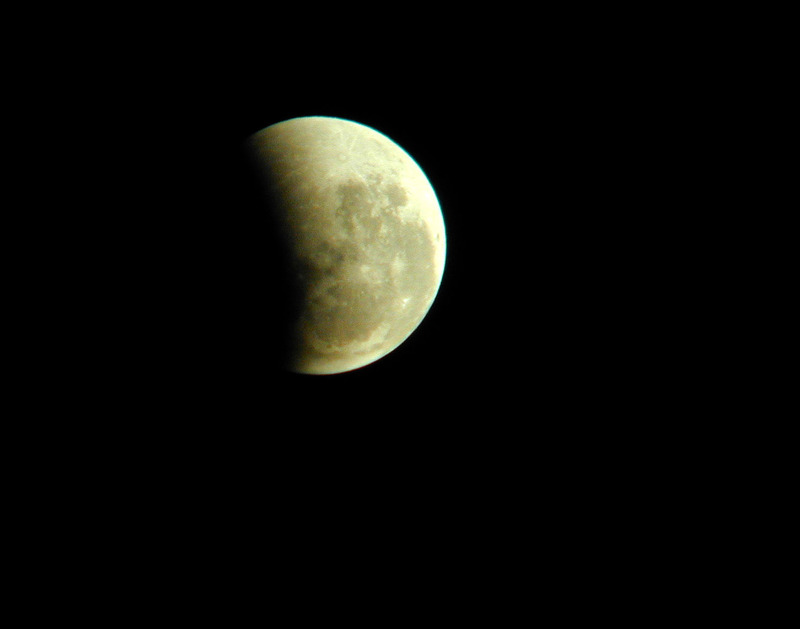 Since we're both located in the same time zone, the moon began its coursethrough the Earth's umbral shadow at 10:01 pm. That was when the moon wasbright and full, but one side of it was gradually becoming blackened). (Theeclipse actually started at 9:02 pm, when the moon was passing through thepenumbra, Earth's lighter shadow.) At 11:04 pm, the entire moon was withinthe umbra; the Earth's shadow completely covered the moon, and the moon wasred, as seen in your Photo 1. This condition, "totality," lasted for 78minutes until 12:22 am. At 12:05 pm, which was when you took Photo 1, themoon had almost completed its passage through the umbra. Photo 2: Totality lasted until 12:22, and the moon continued moving out ofthe umbra until 1:25 am, when the moon was completely out of the umbra. At1 am, when you took Photo 2, the full moon would have been partiallyshadowed because it was in the process of emerging from the umbra. I really enjoyed looking at your pictures! I tried taking some myself witha digital camera on a tripod; none of my pictures looked as spectacular asyours. (Magnification helps!) It was also somewhat windy here that night,although we had clear skies for excellent viewing. I hope some of thisstuff helps out!